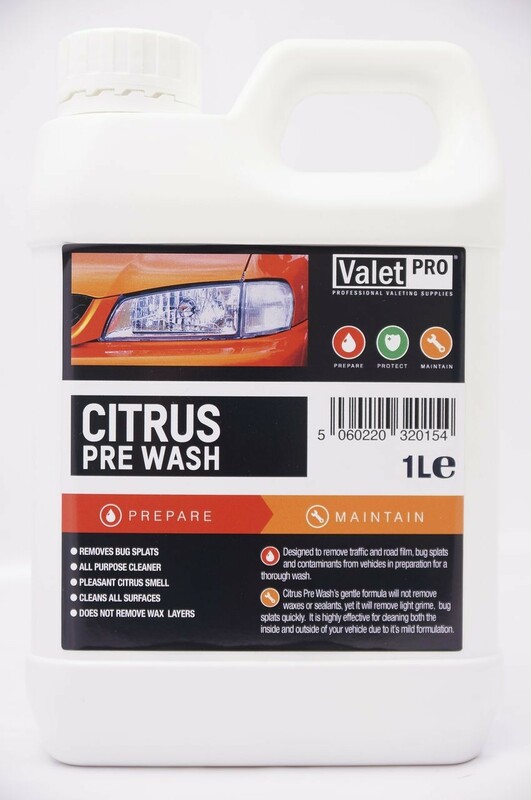 Our Citrus Pre-Wash is excellent at Traffic Film Removal, but a huge plus is that our product won&apos;t strip wax or paint sealant from paintwork, saving you precious hours re-waxing. Our Citrus Pre-Wash is excellent at Traffic Film Removal, but a huge plus is that our product won&apos;t strip wax or paint sealant from paintwork, saving you precious hours re-waxing. Use it prior to shampooing a vehicle to remove dirt such as grit. bugs and bird droppings. It can be used with a pressure washer system or through a pump sprayer. Orange Pre-Wash is just that. A product designed to pre clean your car prior to shampooing. The purpose behind all TFR&apos;s (Traffic Film Removers), Snow foams and pre-washes is to remove traffic film such as grit, bugs and bird droppings. The biggest difference between Orange pre wash and other traffic film removers is that it is wax safe. It has been designed not to strip wax and paint sealant in quite the dramatic fashion that a normal TFR would do. Using a cleaner like this helps to preserve your protection on your car. Orange Pre-Wash will remove general grime and bugs and it is especially good at removing bird droppings. Simply spray over the bird dropping, leave for a minute then re spray. You will quite often find the bird dropping will separate and be moved off its spot from the small pressure of the pump spray. Orange Pre-Wash, like many other wax safe products, is best used on cars prepared with good quality waxes or sealants. You can be confident that the cleaning ability is excellent, but won&apos;t stripping wax thus reducing your work load. Products like Orange Pre-Wash are important to use should your customers have a dealership paint sealant like Supaguard, Diamond Brite or Jewel Ultra. Another bonus of this products is that customers are always impressed with the smell, as when using Orange Pre-Wash there is a pleasant Orange smell in the air. This can also give your customers the confidence that you are using a high quality product on their car. Orange Pre-Wash can be applied via foam lance or pump spray. Dilute up to 1:10 in a pump spray and foam system final dilution will be about 1:300.